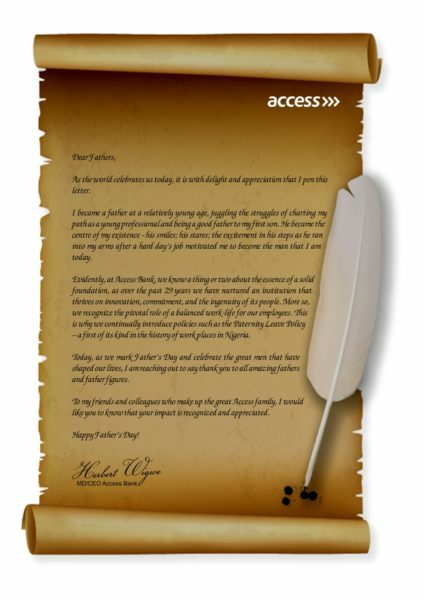 If it has been a while you showed love to the man you call father…Just copy Herbert Wigwe’s letter to Fathers on this special Father’s day and watch your Father Blush!. As the world celebrates us today, it is with delight and appreciation that I pen this letter. I became a father at a relatively young age, juggling the struggles of charting my path as a young professional and being a good father to my first son. He became the centre of my existence – his smiles; his stares; the excitement in his steps as he ran into my arms after a hard day’s job motivated me to become the man that I am today. Evidently, at Access Bank, we know a thing or two about the essence of a solid foundation, as over the past 29 years we have nurtured an institution that thrives on innovation, commitment, and the ingenuity of its people. More so, we recognize the pivotal role of a balanced work-life for our employees. This is why we continually introduce policies such as the Paternity Leave Policy – a first of its kind in the history of work places in Nigeria. Today as we mark Father’s Day and celebrate the great men that have shaped our lives, I am reaching out to say thank you to all amazing fathers and father figures. To my friends and colleagues who make up the great Access family, I would like you to know that you impact is recognized and appreciated. This is Lovely, what do you think? Previous articleNkem Says: Is Anybody Really Single?